Is this a measurement tool or a compliance tool? NIST developed the monitor to estimate answers to measurement questions about the extent and quality of IPv6 and DNSSEC deployment in the USG and Internet as a whole. NIST uses the data to understand and guide its work in standards development and deployment guidance. Why are the measurements labeled "Estimates"? The monitor employs sampling techniques and heuristics to estimate the extent of deployment within a few top level domains (TLDs, i.e., .gov, .com, .edu). We sample (as oppose to exhaustively test) those TLDs by only looking at a sub-set of second level domains in each TLD. We don't look deeper in the DNS tree, unless specifically asked too by a domain owner to support their own testing. Even at the second level, our sub-set of test domains are in no way exhaustive. The methodology sections below describe how we chose the domains we test. Do you test all of .gov? As noted above, we only focus on second level domains, so there are vast number of 3rd level and deeper .gov domains that we don't test. Having said that, since data.gov provides a listing of most USG second level domains in .gov, our coverage of that sub-set of domains is fairly complete. For a given domain, what heuristics are used? We are trying to estimate the extent of deployment on public facing services. Currently we only focus on DNS, Email, and WWW. When measuring IPv6, we use heuristics to determine if a domain intends to provide Email or WWW services at all. The fact that such a service is not operational over IPv6 is definitive, the statistics that try to estimate the percentage of domain completion take into consideration that many of these services are not available by design. Is there uncertainty in the individual service tests? Certainly, the monitor runs from a single subnet that is reachable over an Internet 2 routed path (see below). If the servers of a given domain are not reachable (over IPv4 and IPv6) to this subnet, at the point that the monitor runs, the results will show failures. Sometimes these failures are transient (e.g., routing, firewall misconfiguration, etc). While we don't think these issues significantly impact the general results, clearly on any given instance of the monitor run, individual domains and/or servers might display transient reachability errors. Will you add my specific domain into the sample set? Maybe. It is not our intention to enumerate all sub-domains of .gov, .com, and .edu. Having said that, many operators ask us to add their sub-domains as a diagnostic tool in assisting their initial deployments. We try to support those requests if appropriately interesting and relevant. "Transition Phase - January 2010 to December 2011 Organizations MUST arrange for IPv6-based Internet connectivity for any Internet-facing servers (e.g., web, email, and domain name servers). Internet-facing IPv6 servers SHOULD be treated as production by the organization, and SHOULD be treated as production by other Internet organizations." RFC5211 An Internet Transition Plan. "Upgrade public/external facing servers and services (e.g. web, email, DNS, ISP services, etc) to operationally use native IPv6 by the end of FY 2012." OMB IPv6 Transition Memo Sep. 28, 2010. The guidance above suggests that we are in a period in which we should expect USG agencies to enable native IPv6 capabilities on external facing servers. The obvious questions to ask in this undertaking is "where are we now?" and "are we making progress?" with respect to these goals. "Upgrade internal client applications that communicate with public Internet servers and supporting enterprise networks to operationally use native IPv6 by the end of FY 2014." While we don't have the ability to independently test and measure the progress of this deployment in the same way as the FY2012 goals, we do provide a set of test and debugging targets (IPv6 enabled services) for agencies to use in testing and demonstrating implementation of the FY2014 OMB goals. Additional information and access to these services. This monitoring tool has been developed to try to answer the questions above. The tool attempts to characterize that state of IPv6 deployment on external facing core network services and to track the progress of IPv6 deployments over time. The monitoring tool examines the IPv6 and IPv4 status of DNS, Mail, and Web services for domains on a regular (daily or weekly) basis. USG results post every day ~3pm while Industry and University results update on the weekends. 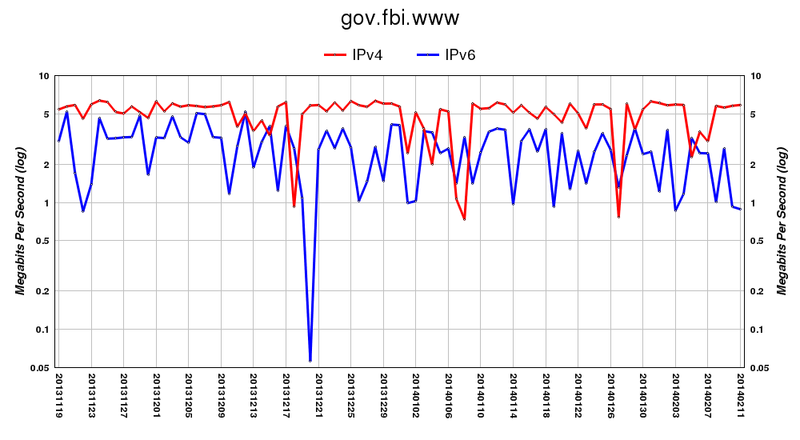 The most recently collected data is displayed for both protocols as are the IPv6 adoption statistics over time. Note 1, this tool is unrelated to the USGv6 Profile and the USGv6 Testing Program. That is, no attempt is made to assess if the services monitored are running over IPv6 stacks that are compliant with the USGv6 Profile. The USGv6 Program is focused on acquisition and makes no recommendations about deployment scenarios. This tool on the other hand, only focuses on deployment issues. Given an agency domain and web site, a DNS query is performed to find all SOA, NS, and MX resource records and all unique A records assigned to the web server. For every resource record (RR) returned a comparison is performed to see if the record is [I]nside the domain under test, exists in the [P]arent domain, or is [O]utside of the domain under test. When examining all agency domain results for an individual resource record, if a combination of [I],[P],[O] exists the service under consideration is labelled as [M]ixed. Note, the [I,P,O] designation is determined by a string comparison and may not reflect actual ownership scenarios. For example, www.commerce.gov is an alias to www.doc.gov meaning both commerce.gov and doc.gov testing will examine www.doc.gov. The results will then show the commerce.gov web server to be [O]utside of commerce.gov and the doc.gov web server to be [I]nside of doc.gov despite commerce and doc being the same agency. Momentarily disregarding the counting (#/#/#) information, and absent color designations, Agency One had three  NS records all internal [I] to the domain. One  MX record was found, which was inside [I] the domain. One  web server A record was returned in the [P] parent domain. For Agency Two, six  NS records were found, in a mix [M] of locations. One  MX record was returned from outside [O] of the domain. The lone  web server A record was internal [I]. For Agency Three, two [O] oustide NS records were found. Three  MX records were located, all of which were in the parent [P] domain and four  web server A records were returned from outside [O] of the domain. Finally, for Agency Four, no NS records were returned so it is marked as [S] SERVFAIL and [L] Lame. No MX record was found so a  and a [-] are listed. Likewise, zero  web server A records were returned so there can be no [-] location designation. After retreiving all of the domain's information, A and AAAA DNS lookups are performed on all service hostnames. From there, all uniquely assigned IP addresses are inserted into an array with the number of elements becoming the server assignment data point. For example, if three unique NS IP addresses were found the service count would be 3/#/#. Next, all addresses are pinged and the number that respond are represented as the reachable server data point. Continuing the example, if two of the three NS addresses respond to ping requests the service count becomes 3/2/#. Finally, there is an attempt to reach the service, on every address, over the Internet Protocol under test. The number of interfaces that respond are displayed as the operational data point. Concluding the example, if connections are successfully made to all three addresses, the service count would be 3/2/3. Also, if all attempts to a web server's IP addresses fail, a final attempt is made to the web server name. If that is successful an N is placed in the field, 3/2/N. Additional data is collected during testing, including services that are outsourced, IPv6 allocations (CIDR), and operational service response times. Regardless of location (i.e, [I][P][O]), all service IP addresses, unique in scope to all domains being tested, are counted to produce a comprehensive Unique Configured Service Interfaces graph, Unique IPv6 Operational Serivce Interfaces Over Time graph and an IPv6 Operational Service Domains Over Time graph, all of which are displayed on top of the results page. Finally, the Domain and Organization entries are linked to the domain homepage and the agency results, respectively. The most basic metric collected is the comparison of IPv4 and IPv6 operational interfaces, represented daily in the USG Unique Configured Service Interfaces graph. The current graph is below. The Federal Executive Agency Internet Domains information used by the monitor includes the domain name address for each domain. This URL is examined and all links found are tested for IPv6 operational readiness. The 'drill down' results for each domain are displayed on a page accessible from the Links column. The percentages shown in this column are explained in item #7 of the table explanations below. 1. Header Information includes the title, date, domain, and agency. The collected vaules, for IPv4 and IPv6, are the seconds [s], bytes [B], and megabits per second [Mbps] for http GETs to the listed URL. The remaining two fields, 6/4[Mbps] and v4|v6, show a comparison of throughput values for the two protocols and the corresponding graph. Note, while throughput values are collected every time a URL appears, the daily graphs are generated using the throughput information collected on the initial inspection. This means a throughput graph may not exactly correspond to the data listed. For example, many domain sites reference www.facebook.com, and all of those domain tables will have unique throughput data for facebook, but the facebook graph will only show the data collected the first time facebook was inspected that day. 2. The referenced URL portion of the table. Each line is a URL found on the DUT homepage. Results are displayed alphabetically and not in the order found. This line will note if the URL used was (https) and whether the IPv4 and IPv6 GETs were redirected, [v4R] and [v6R]. The redirection statistics link to the redirected URL and are in the format number_of_redirects/time_in_seconds. Above, in the com.facebook.www line, there were two IPv4 and two IPv6 redirections, which took 0.080s of the total 0.430s IPv4 GET and 0.077s of the total 0.381s IPv6 GET. 3. All referenced URLs, which are subdomains of the original DUT are given a blue field. The URL of the DUT's homepage is noted with a leading "•" and is also blue. 4. Collected results are displayed with color designations continued from the general monitor; a green field designates protocol operation while a red field indicates the GET was not successful, i.e., protocol not operational. Unless both IPv4 and IPv6 are operational there can not be a throughput comparison and the 6/4 field is populated with n/a. The graphs will plot whatever operational data there is every day. 5. If the GET retrieval size for IPv6 is not within 10% (90-110%) of the IPv4 GET retrieval, the field is colored yellow. It is generally expected that the files returned will be close in size. Similarly, if the throughput for IPv6 is less than half (<50%) that of IPv4, the field is colored yellow. The yellow field signifies a condition, which may be problematic. 6. On occasions where a response time is recorded (note the 3.125s, signifying a server was reached) but no data was returned, the field is colored white and treated as not operational. 7. The number of referenced domains that are IPv6 operational. The first result is only for the subdomains (the URLs colored blue in #3). The second result is for all of the referenced domains. In this example, those percentages are 100% and 69%, which are the values shown in the Links column in the monitor results. The color designations pertain only to the referenced subdomain results: 100% is green (complete), 0% is red (no progress), and every value in between is yellow (in progress). The last column in the table displays the DNSSEC status of the domain. The three values shown (e.g., S/V/C) represent the DNSSEC characteristics: Signed, Valid and Chained, which together establish one of four possible states: Good, Signed Island, Unsigned, and Error. The monitor sends a query for the DNSKEY of the zone and if a DNSKEY RR is returned the zone is considered Signed and Valid. If no DNSKEY records are found the zone is considered Unsigned. If an Error response is returned the monitor attempts to see if the error is DNSSEC related and sets the Valid bit accordingly. The monitor then sends a query to the .gov parent zone to see if the zone has uploaded its DNSSEC key material and has a valid secure chain (from .gov). If DNSSEC material is found the Chained value is set and, if not, the zone is an Island, meaning it may be signed but those signatures may not be trusted since the parent does not know they are signed. Results are collected to produce a DNSSEC Enabled Domains Over Time graph. The four graphs above show the service information returned by the monitor for the Department of Commerce on February 26, 2012 (2012.02.26). The DNSSEC Enabled Domains graph shows that 108 of the 131 domains tested were DNSSEC Operational (green), 6 had some level of DNSSEC configured but not working (In Progress,yellow) and 17 domains had no DNSSEC configurations (No Progress,red). The Completed IPv6 Enabled Domains graph consolidates all three IPv6 service checks for a domain and colors them as follows: if all three services (DNS,Mail,Web) are a combination of IPv6 Operational (green) and intentionally not assigned (gray) then the domain is considered IPv6 Operational. Likewise, if all three IPv6 services show a combination of No Progress (red) and intentionally not assigned (gray) then the domain is labeled No Progress. Any other combination of IPv6 service results gives the domain an In Progress (yellow) designation. In the Completed IPv6 Enabled Domains graph above 3 domains were Operational, 25 were In Progress and 103 showed No Progress. The Completed line on the IPv6 Enabled Domains bar graph shows the same metric as does any graph with Completed in the title; the SnapShot graphs and the CFO Summary page IPv6 graph. Download version 1.0 of the Software. Please note the usgv6-deploymon.antd.nist.gov server you are viewing is hosted on the NIST, Department of Commerce [2610:20:6000/36] IPv6 allocation. The results shown here were collected by our monitor, which has IPv6 connectivity through the same network. For IPv6 service tests to be successful, the Domain Under Test (DUT) must have a route to [2610:20:6000/36].